Winter sports have long been the poor relation among the galaxy of sporting activities covered by the partnership of Yahoo! and Eurosport news. The latest versions of the Eurosport iPhone app, however, have added not only Figure Skating but also key winter sports disciplines such as Alpine Skiing and Biathlon to the sports categories. 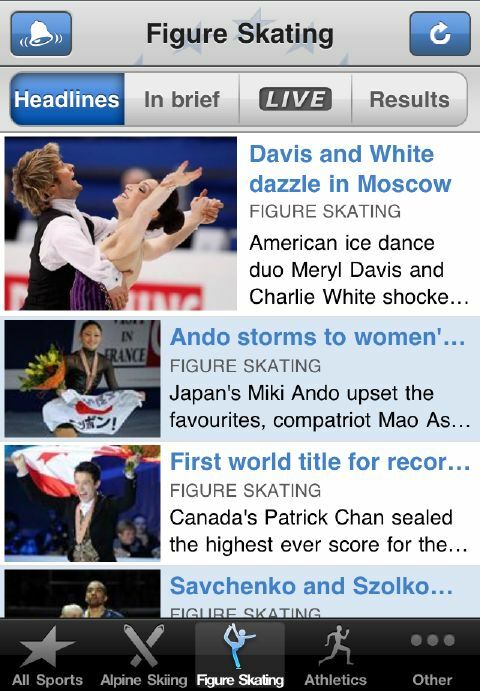 A customize option means that Figure Skating can be dragged down to replace one of the main sports on the bottom bar of the app, reducing the need to be unduly troubled by news about Football or Cricket…. unfortunately, each update of the app seems to override this setting. A results service shows skaters’ positions at internationals, although only for the 2011 World Championships in Moscow. None the less, it could be useful for skaters who want news on the move from next season. The Eurosport app is available in the App Store.